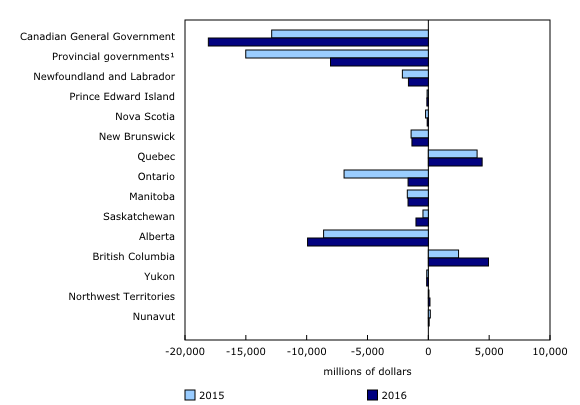 The deficit of the Canadian General Government (CGG)—federal, provincial-territorial and local governments combined—in their consolidated net operating balance totalled $18.1 billion in 2016, following a $12.9 billion deficit in 2015. This increase was largely attributable to expenses (+2.6%) outpacing revenues (+1.9%). The net operating balance, also referred to as surplus or deficit, is calculated as revenues minus expenses over a reference period and constitutes a summary measure of the sustainability of governments operations. The net operating balance deficit for the federal government totalled $10.0 billion in 2016, compared with a $2.1 billion surplus the previous year. Total federal expenses grew 4.2%, due to an increase in social benefits (old age and family allowances) and grants to provinces and territories expenses, while revenue edged down 0.1%. On the other hand, consolidated provincial-territorial and local governments (PTLG) posted an $8.0 billion deficit in their net operating balance in 2016, following a $15.0 billion deficit in 2015. The increase in PTLG revenue (+3.6%) outpaced the growth in expenses (+2.1%). Net operating balances in deficit were reported in 9 of 13 jurisdictions. Alberta (-$9.9 billion), Manitoba and Ontario (each -$1.7 billion) had the largest deficits in 2016. Saskatchewan and Alberta experienced the largest drop in net operating balance in 2016. While still in deficit, Ontario's net operating balance improved the most, due to higher corporate income taxes and taxes on goods and services. The largest surpluses in net operating balances in 2016 were recorded in British Columbia (+$4.9 billion) and Quebec (+$4.4 billion). In 2016, CGG reported consolidated revenues of $728.6 billion, with taxes and social contributions accounting for 83.7% of total revenue. The remainder includes revenue from sales of goods and services, interest and dividends and other sources. PTLG consolidated revenues totalled $529.3 billion in 2016, with taxes ($323.5 billion) and social contributions ($13.6 billion) accounting for 63.7% of the overall total. The federal government, in turn, had $288.5 billion in total revenue in 2016, down slightly (-0.1%) from 2015. The increases in total revenue from taxes (+1.3%) were more than offset by lower social contributions (-2.6%) and other revenue (-18.1%), mainly dividends from government business enterprises and voluntary transfers other than grants. Measured in nominal dollars, and on a per capita basis, the CGG fiscal burden—tax revenues and social contributions imposed by governments on individuals, businesses and non-residents—increased from $16,617 in 2015 to $16,827 in 2016. 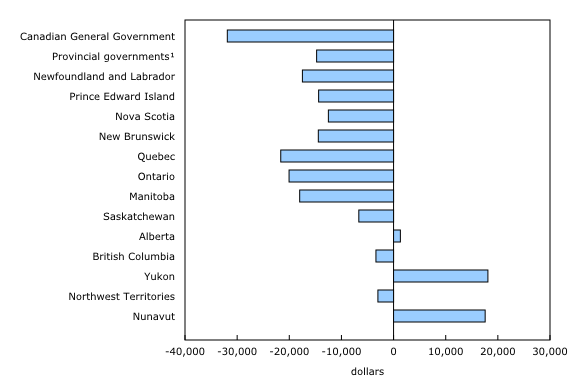 The PTLG fiscal burden per capita rose in eight provinces, with Newfoundland and Labrador (+$1,075) and British Columbia (+$604) recording the largest increases. Declining tax revenues resulted in a lower fiscal burden in Saskatchewan (-$639) and Alberta (-$121). In 2016, $84.3 billion of Canada's PTLG consolidated revenues came from grants, up 5.4% from $80.0 billion in 2015. This was the largest increase since 2009 (+16.8%), when Canada's Economic Action Plan was launched following the global recession. PTLG grants are transfers received from the federal government, including the Canada Health Transfer, Canada Social Transfer, equalization payments, and other current and capital grants. Among the provinces, Prince Edward Island received the most grants per capita ($4,723) followed by New Brunswick ($4,143), while British Columbia ($1,728) recorded the least. PTLG in the territories are highly dependent on federal funding, where it represents on average 74.4% of revenues, compared with 15.3% in the provinces in 2016. The CGG paid 7.9 cents in interest for every dollar of revenue in 2016, which represents $57.4 billion in interest expense. This ratio was down compared with 2015, when it stood at 8.2 cents. The ratio of interest expense to revenue provides a measurement of the public debt burden. The more interest a government has to pay to service debt, the fewer funds it has at its disposal to administer government and deliver services. In 2016, PTLG interest expenses totalled $35.6 billion, up slightly from $35.1 billion in 2015. Among the provinces in 2016, Newfoundland and Labrador (at 10.1 cents compared with 10.9 cents in 2015) and Quebec (at 10.2 cents, down from 10.4 cents in 2015) continue to have the highest PTLG interest expense to revenue ratio. Alberta (at 1.6 cents, up slightly from 1.5 cents in 2015) had the lowest interest expense to revenue ratio followed by Saskatchewan (at 3.8 cents, up slightly from 3.6 cents in 2015). The federal government paid 7.6 cents in interest for every dollar of revenue in 2016, compared with 8.2 cents in 2015. Since revenues decreased slightly and the stock of interest bearing debt increased in 2016, this decline in the federal government can be traced to lower average effective interest rates. The presentation of expenses according to the Canadian Classification of Functions of Government provides an important picture of the role governments play in delivering services such as health, education, social protection and public order and safety to citizens. In 2016, combined expenses on health (24.7%) and social protection (24.7%) accounted for about half of total CGG expenses. CGG expenses in general public services (15.4%), education (13.7%), economic affairs (8.2%) and public order and safety (5.1%) followed. Health expenses represented the largest share of total expenses in all PTLG. Among the provinces, Nova Scotia (38.7%) spent the most, and Saskatchewan (31.2%) the least. Education was the next largest category for most provincial PTLGs, with Saskatchewan (21.4%) spending the most and Quebec (15.0%) the least. Environmental protection expenses in Alberta PTLG totalled $2.5 billion in 2016, up 71.6% from 2015. The increase was due to subsidies made in accordance with the Climate Leadership Plan in the province. As a result, environmental protection expenses saw the largest growth (+15.3%) for PTLG at the Canada level in 2016. Growth in CGG's financial assets (+6.9%) outpaced liabilities (+2.5%) in 2016, improving the net financial worth (-$1,156.4 billion) by $13.1 billion compared with the level in 2015. CGG held $1,009.8 billion in financial assets, up from $944.6 billion in 2015, mostly in the form of equity, loans to government business enterprises and accounts receivable. In turn, the CGG had $2,166.2 billion in liabilities, mostly in the form of debt securities, pension liabilities and accounts payable. Alberta, Yukon and Nunavut PTLG recorded a net financial asset position in 2016, while all other jurisdictions were in a net liability position. Net liabilities on a per capita basis were highest in Quebec ($21,639), followed by Ontario ($20,045) and Manitoba ($18,006). While still negative, net financial worth rose in most PTLG, with the largest increase reported in Quebec (+$8.6 billion), followed by British Columbia (+$5.2 billion) and Ontario (+$4.5 billion). Net financial worth decreased the most in Alberta (-$10.5 billion), followed by Saskatchewan (-$1.9 billion), Manitoba (-$1.4 billion) and Newfoundland and Labrador (-$1.3 billion). This release includes revisions to both unconsolidated and consolidated Canadian Government Finance Statistics data for the 2014 and 2015 reference periods as well as the addition of the 2016 reference period. Data are revised back to 2008 for municipalities and other local public administrations (CANSIM table 385-0037) and for the Canadian Classification of Functions of Government (CANSIM table 385-0040 and 385-0041). For the first time, preliminary Canadian Government Finance Statistics data are published eight months after the end of the fiscal year, therefore; estimates were prepared before several public accounts and financial statements were audited and published by government entities. Consolidation is a method of presenting one overarching statistic for a set of units. It involves eliminating all transactions and debtor–creditor relationships among the units being consolidated. In other words, the transaction of one unit is paired with the same transaction as recorded for the second unit and both transactions are eliminated. Consolidated data are released for the provincial–territorial and local governments (PTLGs), which include provincial and territorial governments, health and social service institutions, universities and colleges, municipalities and other local public administrations, and school boards. The constitutional framework of PTLGs in the territories differs from that in the provinces, leading to differences in the roles and financial authorities of government. These differences, as well as other geographic, demographic and socioeconomic dissimilarities between the North and the rest of Canada, give rise to marked disparities in government finance statistics. PTLG data can be compared across provinces and territories because consolidation takes into account differences in administrative structure and government service delivery by removing the effects of internal public sector transactions within each jurisdiction. Because PTLG finance statistics vary significantly across jurisdictions in Canada due to size differences, per capita data are used to facilitate comparisons. Per capita data are based on population estimates for Canada, the provinces and the territories, available in CANSIM table 051-0001. Consolidated data are also released for the Canadian General Government (CGG), which combines federal government data with PTLG data but excludes data for the Canada Pension Plan and Quebec Pension Plan. In this release, revenues, expenses, assets and liabilities are reported in nominal terms. In 2016, the consolidation method removed $341.7 billion in internal revenues and expenses, as well as $378.5 billion related to internal debtor–creditor relationships for the CGG. The fiscal burden is a fiscal indicator derived from the Government Finance Statistics framework. The fiscal burden, defined as revenue in the form of taxes plus social contributions, is a fiscal analysis indicator proposed by the International Monetary Fund. Net financial worth is defined as the total value of financial assets minus the total value of outstanding liabilities. When financial assets are greater than liabilities the measure is referred to as net financial assets. When liabilities are greater than financial assets the measure is referred to as net liabilities. Annual data correspond to the end of the fiscal year closest to December 31. For example, data for the federal government fiscal year ending on March 31, 2017 (fiscal year 2016/2017), are reported for the 2016 reference year. The Public Sector Universe (Catalogue number68-516-X) is now available for the period from 2008 to 2016 for the federal and provincial-territorial governments, the government business enterprises they control and municipal government sector. The Public Sector Universe is the list of institutional units that are included in the measurement of Canadian government finance statistics (CANSIM tables 385-0032 to 385-0042). The list of reporting entities is a key element in understanding and reconciling Canadian government finance statistics to accounts published by governments. This year's updates include details for nearly 4,500 institutional units in local governments across Canada. The Canadian Government Finance Statistics 2014 classification structure is now available in the Definitions, data sources and methods module of our website.